The Boutique Cupcake Company opened it's doors in 2009, to offer something original, stunning, and different than the traditional 'swish & a swirl'. Our cakes are of uniquely designed and are made to order allowing customers a say in the colour, any particular personalisation, or dietary requirements. We strive to create not only delicious tasting cakes but pictures, and stories - for you to open the box and say wow! Whether for a birth, a birthday, a wedding, to say thank you or 'just because' - every cake, biscuit and edible treat is decorated to your specifications, therefore, every order is unique and a celebration in itself! We pride ourselves on our dedication to perfection and excellent personal service - whether you are ordering a half-dozen gift box or 250 cakes for a function, we believe you should be treated with equal importance. 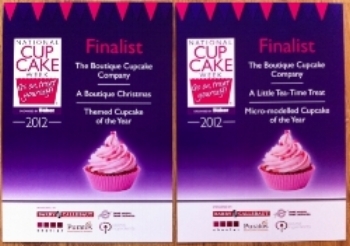 We were thrilled to have been selected as finalists in both the 2012 and 2013 National Cupcake Championships and the years have seen us grow from strength to strength. Our client’s include brides-to-be, “party-throwers”, “gift-senders”, corporate companies and marketing/PR agents; as well as catering companies and event planners. We even have estate agents who send our cupcake bouquets & letterbox cakes to new homeowners! Whilst a much of our work comes through the internet and our on-line store, our favourite customers are those that have been recommended to us, have received our goodies or are returning for more! Whilst none of our cakes contain nuts, we cannot guarantee a nut-free kitchen. We are thrilled to offer free-from options on most of our products. Being free from dairy, wheat or egg should not mean free from design or taste! All free-from cakes and goodies will leave our kitchen as beautiful and tasty as our regular products. Sugar-free cakes are a different kettle of fish .... this means avoiding buttercream and sugarpaste making decorating in our usual style virtually impossible. Please call us to discuss options if you need sugar-free goodies.